I've gotten a bit behind on my prescription writing. The weather here has been really nice, so I've taken a bit of a vacation from the clinic, but I'm back now. I try to answer treatment requests in the order I receive them, but Star and Jack sent in an urgent request for their dad. In case you haven't heard, their dad really hurt his foot. He has a giant thing he has to wear on his foot to make it better (it looks like a cone for the foot to me) and his foot is very colorful, but not in a good way. You all know I mostly prescribe treatment for dogs, but I am not against helping out a human every once in a while. After all, they need all the help they can get! For Star and Jack's dad, I am recommending that Star and Jack start growing and shedding fur at an accelerated pace. They should collect all their extra fur and use some heavy-duty duct tape to tape the fur all over their dad's foot. Obviously he needs some extra padding down their to prevent injury and I'm certain that paw fur will do the trick. 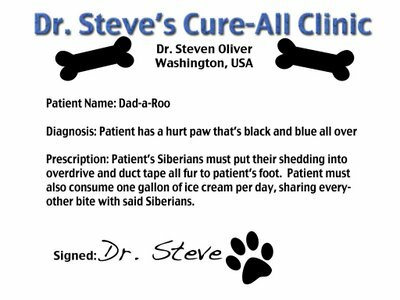 Now while the paw fur will help him heal physically, I also care about the emotional well-being of my patients and have taken care of that as well. I recommend Star and Jack's dad eat one gallon of ice cream per day. Ice cream makes everyone feel better. He should take a bite, then give one bite to Star (ladies first) and then a bite to Jack and then repeat until the gallon is consumed. I know from experience that nothing makes a human happier than giving a Siberian ice cream. Feel better, Dad-a-roo! Oh Dr Steve!! What a wonderful job woo have done!! So noble! Can woo scribe me a cure? I need to get rid of a rash, called COCO!!! Haroooooo!!!!! Normally I would say that flattery won't get you anywhere, but it will at this clinic (just not as far as treats will get you.) I've decided to take a different approach to Mya's problem. I don't think she needs to be rid of CoCo, I just think she should make CoCo her sidekick. I know Mya has a love for countersurfing, so if CoCo was her sidekick, CoCo would be convieniently located near Mya at all times in case Mya needs to appear innocent of any crimes. I'm sure CoCo is good for some entertainment as well. Chasing, chewing, wrestling... all good activities for a sidekick. I hope this helps, Mya! we have a very serious case for you. Benson is a scaredy-dog. he is afraid of everything - humans, dogs, cats, flies (yes, flies! ), food, baths, birds, and more. what would you prescribe for this poor little scardey-dog? Benson would really appreciate your help. What a problem! I'm a bit shocked at this as I know Benson loves to go to the dog park, but with all of his fears, I'd think he'd be afraid to set one paw outside his house! I think a slow introduction of objects to Benson would be best. 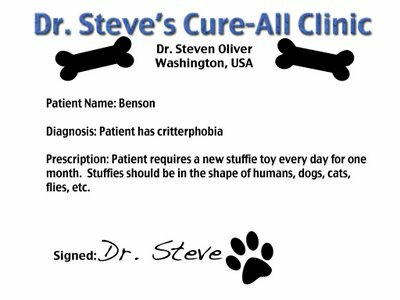 I think that Benson's mom should get him a new stuffie every day that looks like something he fears. Then Benson can chew it and teach it who's boss and realize he's got nothing to be afraid of! Good luck, Benson! I'd hate for you to miss out on any fun dog park times. Well, that's all I've got for today, but I have several other treatment requests to catch up on. Jun 23 Steve plays fetch!